Whether you had diabetes before you got pregnant or you developed diabetes during your pregnancy, you'll need to keep a close eye on your blood sugar levels. Tight control will help you avoid complications and long-term health problems for both you and your baby. You're eating differently because your body needs more energy to help your baby grow and be healthy. And your changing hormones affect how your body makes and uses insulin. 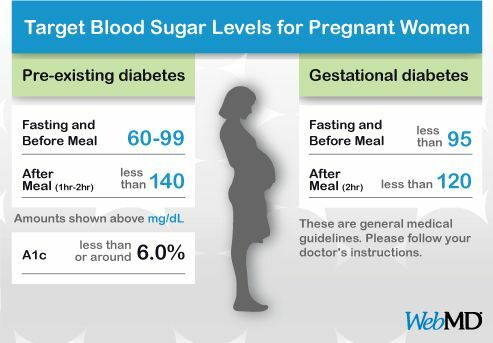 In the later parts of your pregnancy, you may become more insulin resistant, so blood sugar builds up to higher levels. If you are pregnant and have type 1 diabetes, your doctor might sometimes ask you to check your blood sugar in the middle of the night, around 3 a.m. You should check your fasting urine ketones every day, too. For every type of diabetes, if you're pregant you need to see your doctor at least once a month, perhaps as often as once a week. Mensing, C. The Art and Science of Diabetes Self-Management Education Desk Reference, 2nd Ed., American Association of Diabetes Educators, 2011. American Diabetes Association. "Standards of Medical Care in Diabetes—2014," Diabetes Care, January 2014. "Guideline for Detection and Management of Diabetes in Pregnancy," Joslin Diabetes Center, September 2010. Kecia Gaither, MD, director, maternal-fetal medicine, Brookdale University Hospital and Medical Center. University of Rochester Medical Center: "Diabetes and Pregnancy."